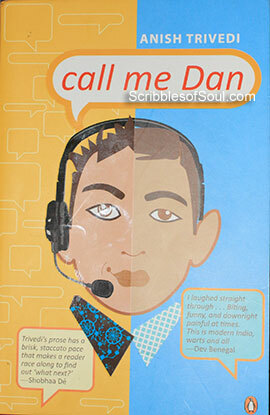 The very first glimpse of the cover page of the novel, depicting a man with half brown and half white face juggling with headphones and desperately showing himself as Dan not Gautam, convinced me beyond doubt that ‘Call me Dan’ is another book on the BPO culture. Highlighting the dubious role of US based call centers, exposing Indians to the less than benevolent side of Americans, and at the same time giving them enough moolah to lead the lifestyles, most Indians would love to emulate, but hardly afford. I decided to follow the advice and began my misadventure. For the first few pages, I found my first instincts to be largely true, however, as the story progressed, Dan aka Gautam grew on me. His awkwardness as a middle class Gujrati Vegetarian, struggling to find a foothold in the night bred Americanized culture of BPO, seemed a sincere though failed attempt, till he got his first American date, Sondra. Her entry in Gautam’s life transforms him completely. He gets comfortable in the skin of Dan, his confidence soars and even his parents come around to accept him as a rare success story. The novel was interesting, while it revolved around Gautam and his sojourns, but the author seemed hell bent on dealing with social and family issues at large, be it Gautam’s sister’s scandalous love affair or the desperation of his thirty year old girlfriend to adhere to the social diktats and get married as soon as she can. Basically, he takes into account almost all of the issues, that create a tussle between the orthodox parents and their progressive off-springs, putting restrictions on the fun filled care free life of the youngsters, and slowed the novel’s pace, making it sound cliche and boring. But, despite these less than enjoyable digressions, the humorous, witty and easy style of Anish Trivedi kept me glued to the novel, and I particularly enjoyed the conversation between Dan and his girlfriend, who were almost always on non-speaking terms. Anish has written this novel from a man’s perspective and it was fun to read a chick lit written for a change by a man. My initial hunch about the novel was not entirely correct, I ended up enjoying it and I would classify Anish Trivedi’s first novel as an okay time-pass.